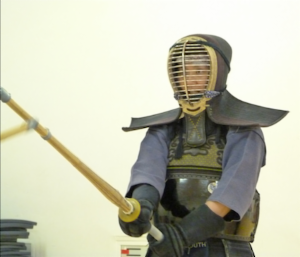 We are a friendly club which is commited to practicing the art of kendo. We always welcome new members to Portsmouth Kendo Club whether you are new to kendo or have no experience and whatever your age or gender. All we require is enthusiasm & commitment. We run structured beginners courses periodically, to ensure that students are learning in a group of similar experienced people rather than throwing them in at the deep end. This helps us in that we can dedicate teaching to a group for a period and helps the students because learning in a shared experience environment is more rewarding. Generally we do not take ad-hoc beginners with no previous Kendo training. Our instructors are all certified and insured by the BKA and, being a BKA affiliated club we are required to comply with a number of controls around coaching, insurance, Health & Safety and Child Protection. All our instructors who work with juniors are CRB checked. The courses are structured over a 8 week duration and are run 3-4 times a year depending on demand. In this period we will teach you the basics of kendo including etiquette (Reiho), stance & grip(kamae), correct cutting action & movement and equipment care & maintenance. At the end of the course you will be proficient enough to join in the main practice. The beginners course normally runs on Saturdays (the wednesday sessions which we run are more advanced) and is taught between 12:30 and 1:30pm and normally run for 8 consecutive weeks. Students are encoraged to watch the session from 1:30 as is an opportunity to see what you will soon be doing and to learn through reflection and observation. It is important that none of these 8 sessions are missed as they are structured to cover all the basics in a progressive way so that beginners are able to join in with the main session on completion. The cost of the courses we run is £75 per attendee which includes Shinai (split bamboo practice sword) Bokken solid wooden practice sword) club membership and 3 months temporary membership of the British Kendo Association. This is everything you need to get you started. Participants will just need to come in loose clothes - t-shirt/tracksuit bottoms. Kendo is done barefoot. It's important that trousers/leggings are not too long that they cover the foot. Watches, jewellery, piercings etc should be removed prior to practice. Once you have completed the beginners course you will be required to pay club fees and take out full BKA membership. Details are here. Additionally at this point you will be expected to start to 'look the part' and dress appropriately. Hakama (baggy trousers) and Keikogi (Jacket) cost about £30-£50 each. The big expense is the Bogu (armour) this will be needed, typically, after a few months. Costs from £150-£200 at the bottom end of the market up to whatever you want to pay. As with most things the more you pay the better the quality. But £250-£300 will get a good quality starter set and will last for many years. Shinai do break. These typically cost £20-£30. Please contact us if you are interested in joining our next beginners class or have previous experience and would like to join us. We are always happy for prospective members to come and visit one of our session to watch and get a feel for what we do. Please feel free to approach any of our senior members either before or after the session if you have any questions or require any information.